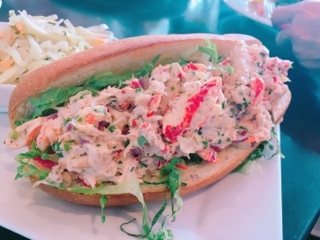 Finding fresh seafood in Scarborough is a breeze if you drive down Lawrence. 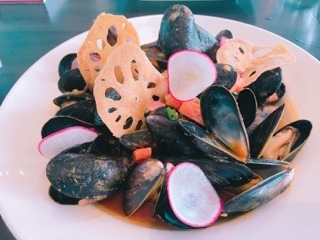 Diana’s has been servicing the area (and many hotels and restaurants across the city) for years, whether it’s for home chefs sourcing ingredients at their retail store or diners leaving the task to Diana’s Oyster Bar and Grill nearby. Wanting to beat the crowds, we arrived as soon as the restaurant opened on Sunday at 11:30am. Turns out, people tend to come later (our waitress noted their peak weekend lunch hour is around 1pm), so there was no big rush. However, despite being one of the first to order, the food was still slow to arrive. Generally, I don’t mind things taking time; after all, this ensures there's time to properly prepare items and food should be made-to-order arriving fresh and hot. 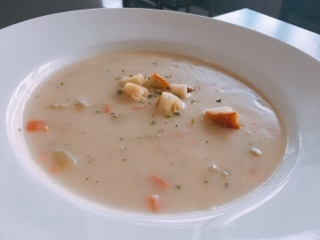 Certainly, the bowls of clam chowder ($10) my parents ordered, which took long to prepare, had steam rising from it; meanwhile, the cup accompanying my sandwich afterwards was lukewarm. Thankfully, the chowder tasted good: creamy but not too rich and the bacon pieces were pronounced adding a nice saltiness. 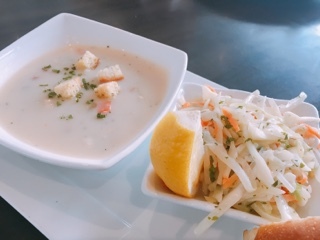 For a place wholesaling seafood, the size of the clam pieces were sadly inadequate as the chowder consisted predominantly of potatoes and little actual seafood. On the other hand, the mussels ($17) were plentiful; the bowl just kept going on forever and ever. Although the tomato broth was good, I was disappointed with its taste. When the menu describes it as “Thai Spicy”, I'd imagine there would be heat - something like a tom yum broth. So, when it arrived with absolutely no spiciness, it was a letdown. Moreover, it would have been nice to have something to dip into the soup, the crispy lotus chips were beautiful garnishes but doesn’t augment the dining experience. 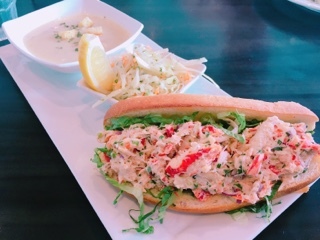 The lobster and crab roll ($18) had a decent seafood to sauce ratio; the mixture wasn't too creamy and you could taste the crab and lobster. Moreover, the shredded lettuce and onions provided a great crunchiness along with the nicely toasted bun. However, going back to my initial point of not minding a wait to ensure things are done right, the experience was tarnished by a plastic wrapper corner mixed into the crab and lobster. Luckily, it was bright orange so it was spotted as soon as I cut into the sandwich, but it was still unnerving. Sure, the sandwich could have been sent back, but I didn’t want to wait another hour for a replacement to arrive. Diana’s catch of the day lunch special ($25) consisted of rainbow trout (should have been cooked a touch less given its thin cut), vegetables, and vegetarian fried rice. 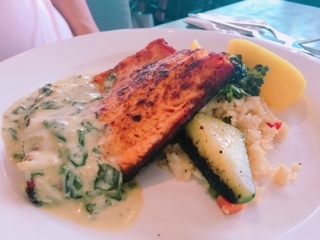 The creamy spinach sauce was a tad heavy for me, but overall it was a satisfying dish. It’s a shame that the lunch wasn't better. Diana’s could create some amazing dishes given their access to an abundance of fresh seafood. If only there was more care put into creating the dish – whether it’s ensuring there’s no unwanted additions (as with the piece of wrapper) or the right ingredients are included (as with the lack of chilli in the spicy Thai). For not being particularly busy, the food sure took long enough to arrive … if only that time was actually used effectively.